Do not tell me that God chose me to parent Moe. I don't believe there is a supply of babies hanging around, and when one is to be born, God picks just the right one for us. Jeff and I mixed our genes and out came Moe, perfect and flawed, with beautiful blue eyes and curly hair and autism. Do not tell me that God doesn't give us anything we can't handle. If I were weaker, does that mean Moe would not have autism? You rise to the occasion. You just do. I love Moe so I have no choice but to parent him the best I can. I assure you, it isn't always pretty. Do not tell me that I have been blessed by autism. I do not consider autism a blessing. Moe himself is a blessing, in as much as I believe in that word. He is my son and I love him unconditionally. But does the fact that he has autism make him more of a blessing than my other, neuro-typical child? Moe and Jelly are my children, completely different, but equally blessed, equally loved, both testing and teaching me every day. Every so often, Moe will do something so appropriate, that I can't help but think he's going to be just fine. Maybe Moe isn't even autistic, perhaps just severely speech delayed. Someday all of this will be behind us. Moe is going to continue to grow and develop and learn how to cope in this world. But he he will always have autism, be autistic. I still can't quite let go of my dreams of Moe's future. In my head, he's an architect. Maybe he still will be. But maybe not. I don't know. But those are my dreams, not his. They are irrelevant. Have I found acceptance, peace with where we are in life? Have I stopped asking "why me, why him?" This post was inspired by the book Expecting Adam, by Martha Beck. I was given a copy of this book as part of From Left to Write. 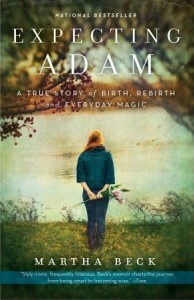 Read other posts inspired by Expecting Adam on Thursday, November 10, at From Left to Write.